Without animal health products Ireland would need an additional 6.7m cattle to meet current production requirements. This would increase the output of manure by 89% and likewise would lead to an 89% increase in methane gas production. Without plant protection products, current production levels would require an increase of 60% in our arable land, allowing for reduced yields and the need to farm less productive land. Such an expansion of the area ploughed would increase the risk of nitrate pollution as a natural phenomenon which occurs when grassland is ploughed. 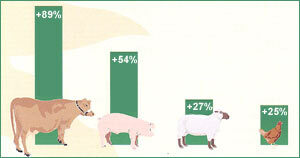 Increase in European livestock numbers required to maintain production at existing levels without veterinary medicines.